Those who want to buy ticket through online final piala malaysia JDT VS PAHANG 1 november 2014, you can go to this link website. How to redeem the ticket? So, when the payment has already settle, need to keep the receipt print frim internet, and bring your own ic redeem at counter stadium bukit jalil by wednesday, thursday and friday. So selling ticket add bukit jalil. Children RM 5.00 below 12 years. You can buy ticket final at stadium tak sri haji yunus, larkin johor for fans jdt. Whether for fans pahang you can buy ticket at stadium darul makmur, pahang. The selling ticket from this wednesday, thursday and friday. But I recommend to buy tomorrow because sure this selling ticket will finish by one day, in just a few hour. There must be a quota to another vvip, others and so on la. No comment for this issue. My siggestion is to buy through online, no need ro queue, fighting each others, buy from “ticket worm” haha. All the best both of this team. 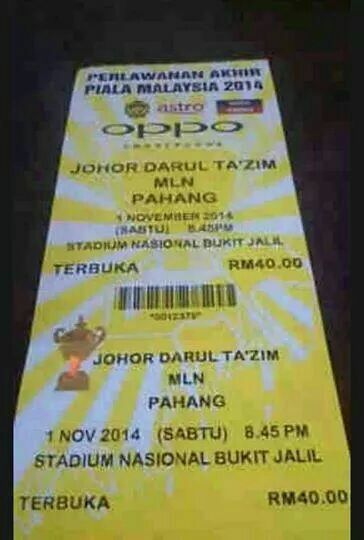 The final match johor darul takzim (jdt) vs pahang at stadium bukit jalil for this saturday, 1 november 2014. Can pahang defend champions like”s last year defeat kelantan 1-0. But this year still same coach, which is bojan hodak vs dollah salleh. But, zainal abidin is the second coach. The match round of 8 for the match english premier league epl/bpl 25&26 october 2014. The epic match is waiting for the match between manchester united vs chelsea tonight 12:00 malaysia time.